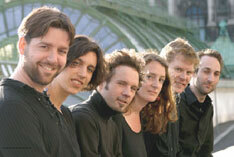 Ensemble vivante has quickly become recognized as an exciting new presence in the world of early music. Its unique sound results from an original combination of musicians: tenors Belgian Tore Tom Denys and American Erik Leidal sing with four Austrian instrumentalists. The array of instruments played by Christopher Dickie (theorbo, Baroque guitar, colascione), Anne Marie Dragosits (harpsichord, organ), Daniel Pilz (viola da gamba, Baroque guitar) and Reinhild Waldek (Baroque harp, recorder, viola da gamba) produces a vast range of musical environments in which to place the singularly homogenous sound of the tenors' lyric voices. vivante's unusual formation enables the ensemble to devote special attention to the tenor duet. This form of composition flourished in Italy during the first half of seventeenth century and spread quickly throughout Europe's courts. Combining the expressive strengths of both solo and choral writing, the tenor duet became a popular sub-genre of the vocal music of its era. Examples can be found in both dance tunes and sacred music, in the madrigal as well as in the lighter genre of the villanelle. Ensemble vivante devotes special attention to the performance of lesser known and nearly-forgotten works written by composers of the era's most captivating music. While composers such as Monteverdi and Frescobaldi are well-known today, many pieces featured by the ensemble are written by composers who have been rendered insignificant over the course of time. In many cases, this has amounted to a rediscovery of works rarely, if ever, heard beyond the time of their composition. Indeed, the ensemble's debut recording of Giovanni Girolamo Kapsperger's sixth book of villanellas (printed in Rome in 1632) would most likely have remained relegated to the archives had vivante not investigated it. The CD appeared in 2006 in the Austrian Broadcasting Corporation's early music series (ORF Edition Alte Musik). Their second CD, Alla Luce, featuring rare duets from Frescobaldi, Strozzi, Rovetta, Monteverdi and Kapsperger, was released by the ORF in September of 2009.
vivante was awarded the first prize at the Johann-Heinrich Schmelzer Competition at the International Baroque Music Festival in Melk 2005. The ensemble has appeared at Vienna's most prestigious early music festival Resonanzen at the Konzerthaus, and is heard regularly on international broadcasts. Recently vivante has been well-received at the Festival Itineraire Baroque in the Dordogne region of France as well as at the Summer Festival in Brunnenthal, and made its debut at the Festival van den Vlaanderen in Bruges, Belgium.